The freeway was always planned as a six lane facility, with the exception of a four lane possibility through the central business district of Mobile (the alignment south of Beauregard Street)2. 1982 cost ranges placed Interstate 210 within $104-212 million and the Mobile Area Transportation Study network simulations slated between 24,000 and 65,000 vpd (vehicles per day) by 2005 for Interstate 210. Interstate 210 needed to fulfill several specific transportation needs for the Mobile Urban Area in 1982. The Mobile area experienced a resurgence in economic and population growth after a period of decline in the 1960s, while the growth rate of the city expected to be 50% higher than that of the state of Alabama for the coming decade. Additionally the soon to be completed Tennesee-TomBigbee Waterway connects the Port of Mobile4 to the entire Midwest and Mid-Atlantic regions, thus enhancing of future growth/economic climates of Mobile, Prichard, Chickasaw, and Saraland in conjunction with increased accessibility via Interstate 210. The Interstate 210 corridor partitioned into a Northern, Middle, and Southern Corridor. A focus on the Southern Corridor reveals three general plans, all of which utilize the Water Street right-of-way. Alignment “S-1″ takes Interstate 210 elevated on the centerline median of Water Street. Alignment”S-4” parallels Water Street to the east on either a structure (elevated viaduct) or on fill. Alignment “S-6” sees Interstate 210 built over adjacent railroad tracks east of Water Street. It is stated in the 1982 Environmental Impact Study that “all build alternatives in the Mobile Central Business District Area, except the spur, would tend to reinforce the visual separation of the city from its developed waterfront.” The options above illustrate that assessment. The Middle and Northern Corridors of Interstate 210 saw two general paths. Alignment “A” sees a new structure built to the west of Telegraph Road. Alignments “B”, “C”, and “D” diverge from “A” at Three Mile Creek swamp either overtop Telegraph Road or just west of the railroad tracks that parallel Telegraph Road. These eastern alignments would involve more resident displacement as they intrude upon the Plateau neighborhood area of the city of Prichard. Water Street north of Government Street – possibility of adding slip ramps from Interstate 210 northbound to Water Street northbound and from Water Street southbound to Interstate 210 southbound was considered with the “S-1” alignment. This interchange would be constructed in lieu of improvements to the West Tunnel interchange with Interstate 10. Bay Bridge/Telegraph Road – all movements (except alignment “D-2”). Alternate “A” requires a relocation of Bay Bridge Road. The “Spur” concept saw preparation by the City of Mobile during public involvement programs as an alternate solution to the issue of blocking the Central Business District View and contact with the Alabama State Docks and Mobile River waterfront. The spur concept followed three alternatives that were introduced and subsequently rejected in the preliminary stage. These options included an alignment to the east of Mobile via Blakeley Island, a “no-build” alternative, and a spur alternative that ended the freeway north of Beauregard Street. The Blakeley Island proposal was dropped during the preliminary stages due to low traffic use projections compared to the other alternatives reflected in rather low road user benefits figures5. Additionally environmental and other negative impacts were factored into the demise of the Blakeley Island concept. The “no-build” concept was based upon alternative factors such as improving existing infrastructure and the introduction or expansion of existing mass transit facilities. The Beauregard Street terminal was formally presented to ALDOT in a treatise accompanying the Mobile City Commission – Planning Commission joint resolution on April 1, 1982. This concept saw rejection due to the confluence of the south end of the freeway with the Telegraph and Conception Road intersections. Additionally it was stated that the resultant congestion of such a confluence would result in a “poor level of service”, adverse conditions for access to the State Dock’s bulk cargo and container operations, and unacceptable congestion around the Mobile Housing Board’s elderly public housing project west of Conception Street. 1966 and 67 – Public hearings held for the corridor with a second request for Interstate funding submitted to the Federal Government in 1968. 1976 and 77 – Corridor studies documented need for Interstate 10 to Interstate 65 link. 1980 – Interstate 210 Connector approved consisting of 6.25 miles in nominal length. 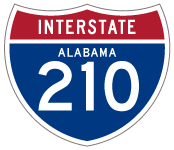 1980 – The Interstate 210 designation became official by Public Law 96-400 during October. Ultimately the Beauregard Street “Spur” concept refused in the preliminary stages was approved for construction. Renumbered Interstate 165 and approved by AASHTO on June 7, 1989, the freeway opened to traffic in October 1994. Alternate “A” represents the current Interstate 165 alignment. The remaining alignments diverged to the east of the Plateau neighborhood of eastern Prichard. the “Spur” alternative was not eligible for federal Interstate funding under the law that designated the Interstate 210 Connector. The “Spur” alternate would end at Congress Street. the “Spur” option includes a widening of Water Street to eight lanes with additional turn lanes. The Port of Mobile is situated at the east end of Beauregard Street along the Mobile River. The Blakeley Island alternative exceeded the allowable corridor length of the Congressionally mandated corridor by 1.7 miles. Additionally the alternative did not serve the Mobile urban core or the State Docks. Page updated September 2, 2003.